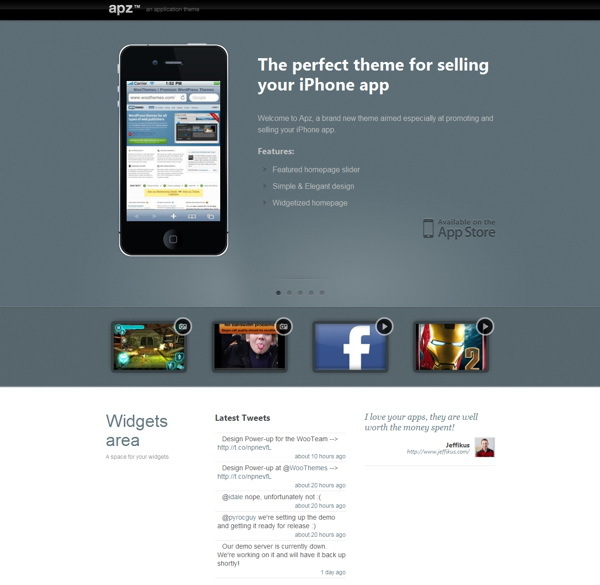 Apz is a dedicated theme to promote or sell your apps, either for iPhone or other platforms. This theme will show the features of your app in a featured slider, and also make it possible to promote it further via the modular homepage layout. Having a good presentation of your mobile application will increase the user interest in it and sell it more and with this wordpress template you will not have to be a designer or a web programmer in order to create such a website, so you can fully focus in developing your mobile application further. With the theme you get a custom homepage that has a featured slider, featured media panel and space for widgets, contact form and latest blog posts. A featured slider that can show screenshots from your application in an iPhone frame (or without frame). Uses WP 3.0 Custom Post Types. Easily add a link to Apple App Store on your slides via our custom settings panel. Show the features of your app with either image or video in the featured panel below the slider (optional). Uses WP 3.0 Custom Post Types. Custom Woo Widgets for use in the widgetized sidebar and footer regions: Post Tabber, Video, Twitter, Blog Information, Ads & Search. And 10 delicious color schemes to choose from. Option to change color of links and buttons in options panel.